Did you notice my newest sponsor Secrets to Tutu Making Success? Click here to find more info on receiving a free tutu lesson and then more info on a whole collection of different tutu styles……all created without a sewing machine. Perfect for that little ballerina! I enjoy finding different ways to add a special touch to a cake. A few months back I gave simple sugar work a try……..and I fell in love with this art. I don’t think you will ever see me on a Food Network Challenge with my sugar work but I wanted to share a simple way to add this edible media to your cakes. Here are the sugar gems we are going to make. Hard candy mold– I bought mine here for $5 with shipping. You can use whatever you want, just make sure it’s for hard candy or made of silicone. It’s best to make candy on a dry day. Sugar attracts water and your candy will get sticky fast if it’s humid. So try this on a clear day. If you are having trouble with sticky candy try using the sugar substitute Isomalt, it attracts less water but is more costly. **Please be so careful when you do this. It’s hot and sugar burs are awful. I have had one and it was not pleasant. This is a great project for when the kids are in bed. Over medium heat bring mixture to a boil. Wisk often. When it comes to a boil, add your candy thermometer and do not stir anymore. We are getting our candy to 300 degrees (fahrenheit). Candy will start to turn brown at 300 degrees so it is important to watch carefully. At 280 degrees, turn your stove down to low and let it come up to 300 degrees. Take your thermometer out and remove your pan from the heat. If you are making clear gems then you are done and you can start spooning into your molds. If you want color you add it here. Start with just a little bit and add more if needed. The mixture will bubble when you add the color…..and that’s ok. If you want to add flavoring to your candy do it at this step. You need flavor oils to do so. I don’t because I like how it tastes plain and I try to keep my cost down. After reaching 300 degrees, I removed the mixture from the heat and spooned some clear sugar into my mold. Then I added a little bit of pink color to make a light pink. Then I spooned more into the mold. Next, I added more pink color to the sugar mixture to make a darker pink, and then spooned it into the mold. So then I had 3 different colors of candy. (You can also try to do clear, yellow, then add a little blue to get green. Try making as many colors out of one batch as you can. Let the sugar cool in the molds. After the sugar is cool, turn your mold over and pop out the candy. Then break off the little strands of excess that may have dribbled while spooning the mixture. Store your candy in an air tight container in a cool dry place. There are your own little edible gems. Here is the cake I used these gems on. I made clear, fuchsia and purple for the colors. I put a dab of buttercream on the backs and attached them to the cake. I learned afterward not to do it too early. I put mine on 24 hours before delivery and had to keep a fan on it the last 12 hours due to humidity. So put your candy on only a few hours before serving. I hope you enjoyed this quick introduction into sugar work. -A tutorial is coming on how to make the crown. -The swirls are piped on with buttercream and a #2 tip. -The glasses were made with the wilton leaf cookie cutter. I used gumpaste and the medium cookie cutter. I cut the gumpaste and then flipped over the cutter to make the other side. Then I used the small cutter to make the eye holes. I made the bridge with my fingers and attached both sides with a bit of water. It dried for 48 hours. If anyone has a cake they have done feel free to post them in the “you made it and love it” section, we would love to see your work! Brittany, you are the best how fun and what an adorable cake! What a great cake, thanks for sharing your talent. Can't wait for the tutorial for the crown. 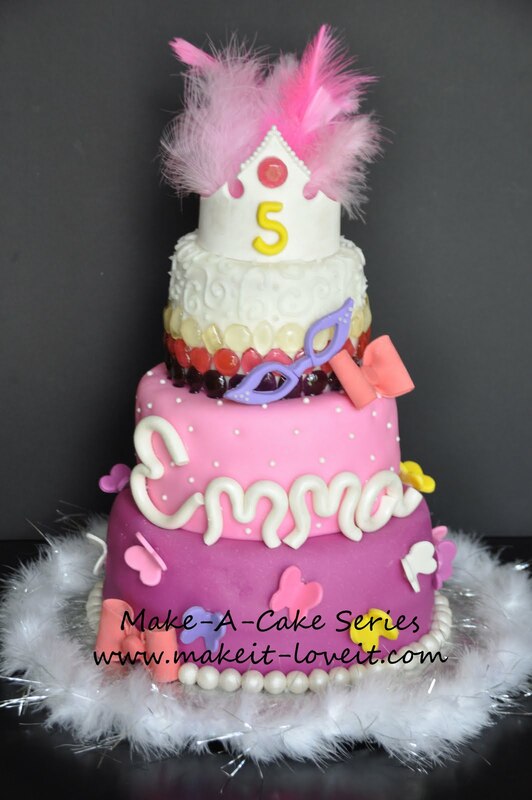 My little one has a birthday coming up and I would love to make one. I am loving this series!!! Keep the ideas coming! This is absolutely the cutest cake I've ever seen! So adorable!!! Are you telling me that I can combine TWO of my favorite things…gemstones AND sugar! I'm in love. I'm wondering about the possibilites of homemade candy bracelets, rings, etc…hmmmm. WOW! 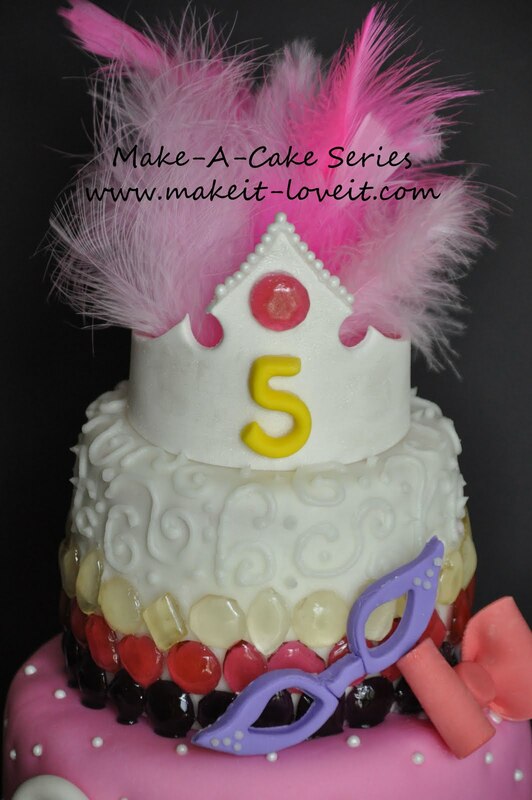 I am throwing my daughter a Princess Party and would love to make this cake. Don't know if will actually happen, but one can dream:) Thanks for sharing! Were your gems still sticky from the plastic mold? The mixture poured into my reusable baking cups isn’t sticky, but the gems from the mold are.